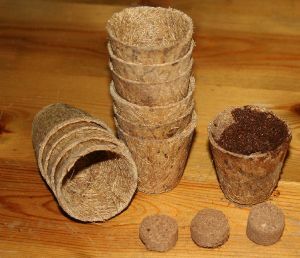 These little pots (4.5cm wide and high) are made from compressed coir - the outer husk of coconuts, in a womens' co-operative in Sri Lanka. The pots are biodegradeable and come with a little plug of coir compost that swells to fill the pot when wet. Ideal for rooting small individual cuttings, or sowing individual seeds, you don't need to disturb the roots at all when potting on or planting out as the roots will grow straight through the coir fibre.